"Restructuring through spin-offs, equity carve-outs, and tracking stockscan create shareholder value. In the longer term, equity carve outs in which the parent company retains majority ownership easily outperform the Russell 2000 index, with an average annual total return to shareholders (TRS) in the two years after issue of 24% as compared with 11%. Spin-offs also substantially outperform the market, showing a two-year annualized TRS of 27%, compared with 14% for the Russell 2000 and 17% for the S&P 500." A 1998 working paper from Pennsylvania State University examined 83 equity carve-outsdone between 1981 and 1990, and found that carved-out companies had significantly higher revenue and asset growth, higher earnings, and higher capital spending than the industry average during the first three years after the carve-outs. A similar study by J.P. Morgan & Co. which examined 101 carve-outs between 1986 and 1997, documented that, on average, the share price of the parent rose between 3-4% in the 90 days following the announch3ent of a carve-out. In the case of 12 carve-out companies in which the parent announced there would be a later spin-off, the share price of the carve-out performed 11% above the market 18 months after the initial public offering. 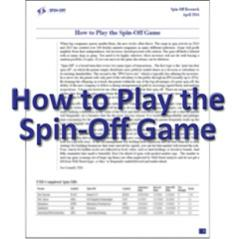 A sample of 174 spin-offs, followed by Professors James Miles and Randall Woolridge of the Smeal School of Business at Penn State University between 1965 and 1994, returned an average of 18% in the first year, 51% in the first two years and 76% in the first three years outpacing the S&P 500 by 31%. "Over the two-year period prior to the spin-off, the stock price of the average parent company outperforms the stock marketby 35% on average. After the spin-offs, stock returns of both the parent and the spin-off outperform the market, on average. Over the entire three-year period, assuming portfolio rebalancing, we find a compounded raw return of 106.6%, which corresponds to a compounded annual return of 27.4%. The largest returns come between one and two years after the distribution month. " A J.P. Morgan study of 231 spin-offs and carve-outsbetween 1985 through 1998 found that during the first 18 months of trading, straight spin-offs beat the S&P 500 by 11.3% vs. 10.1% for carve-outs. Spin-Offs with promising longer-term fundamentals should be purchased no later than six months after the spin-off. Price performance suggests that this is typically an optimal period to selectively buy this class of security. Buying at this time would have yielded the maximum price appreciation over the ensuing 12 to 18 months. These studies demonstrated that the announcement of a corporate spin-off or carve-outis associated with positive stock price movements in the parent's stock. A J.P. Morgan study of 77 spin-offsfrom 1985 through 1995 shows that spin-offs outperform the stock market by more than 20% on average during the first 18 months after the transaction. The same study found that parent companies outperform the overall stock market by 5 to 6%, on average, between the spin-off announcement date and the actual spin-off. There is considerable academic research on spin-offs that suggests that they outperform the general market by a considerable margin. Hite and Owers, Shipper and Smith, and Miles and Rosenfeld document a mean abnormal spin-off announcement return of approximately 3%. Hite and Owers, "Security Price Reactions Around Corporate Spin-Off Announch3ents," Journal of Financial Economics, 1983, vol. 12(4), pp. 409-436; Schipper and Smith, Effects of Restructuring on Shareholders Wealth: The Case of Voluntary Spin-Offs," Journal of Financial Economics, 1983, vol. 12(4), pp. 437-468; and Miles and Rosenfeld, "The Effect of Voluntary Spin-Off Announcements on Shareholder Wealth," Journal of Financial Economics, 1983, vol. 38, pp. 1597-1606 each documents a mean abnormal spin-off announcement return of approximately three percent.